Spinal manipulation relieves pressure on joints, reduces inflammation, and improves nerve function. It has been a trusted form of treatment since the ancient Greek Hippocrates documented manipulative techniques in his writings back in 1500 B.C. Today, spinal manipulation is used to treat conditions such as headaches, allergies, digestive issues, menstrual cramps and of course, pain. There are well over 100 types of adjustment techniques used by chiropractors throughout the world. Some practitioners may use force and twisting, while other techniques are more gentle. Regardless of how they are performed, these techniques are intended to restore or enhance joint function with the objectives of reducing pain and resolving joint inflammation. At Marty Chiropractic & Wellness, we use techniques from the Accepted List of Chiropractic Techniques (ACT List). We mainly practice Manual Diversified Technique, Activator Methods, and Thompson Drop Technique. Somato-visceral: Musculoskeletal --> Internal Organs. This is the reflex or pathway most chiropractors are referring to when they say an adjustment improves the body's ability to function. By adjusting the upper thoracic spine, we influence the sympathetic nerves that go to the lungs. This can help the lungs expand and may improve asthma symptoms. By adjusting the sacrum, we influence the parasympathetic nerves that go to the bladder and intestines. 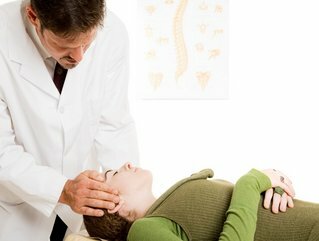 By adjusting the upper cervical spine, we can provide relief for migraine symptoms. This is the reflex responsible when patient's tell us "I knew you could help my back pain but my ______ has gone away too!" One of the most rewarding parts of being a chiropractor is hearing someone say that their lifetime headaches or digestive issues have resolved. Viscero-visceral: Internal Organs --> Internal Organs. An example of this is your blood pressure changing as blood vessels constrict or dilate. Another example would be the release of digestive enzymes following stimulation of the stomach. Viscero-somatic: Internal Organs --> Musculoskeletal system. An example of this is when someone's abdomen tightens and is painful after their appendix ruptures. More examples are gas pains, low back pain when constipated, or feeling cold and clammy when ill.
Neuro-immune: Nervous System --> Immune System. More and more research is suggesting that the body's immune system is regulated by nervous system reflexes. This is great news because chiropractic care may also help boost your immune system and help you fight off illness faster! A chiropractic adjustment should not be painful for most people! Most patients report an immediate release of tension or pain relief following an adjustment. However, some patients are more sensitive, are in more pain, have a low pain tolerance, or have a condition (osteoporosis, fibromyalgia etc.) that may warrant a different type of adjustment. If that is the case for you, we may use a mobilization technique or perform a more gentle adjustment instead. Lakeville Chiropractor Dr. Josh explains some gentle adjustment techniques in the video below.